Transamerica Life Insurance is a great company to consider for a Final Expense, sometimes called a Burial Insurance policy. The rates are competitive, but more importantly are the health conditions and height and weight they will accept, and they offer these policies to younger ages from a new born through age 85. The Transamerica Final Expense plans have three different levels of coverage available for different circumstances: Preferred rate level immediate death benefit, Standard rate level immediate death benefit and the Graded benefit with a return of premiums plus 10% interest if death occurs during the first two years. Transamerica Final Expense plans give you the option to pay with a debit card or credit card, or have it automatically deducted from your Social Security earnings. Most companies will only accept an automatic withdrawal from a checking or savings account for a monthly payment. Very few companies allow a debit card, and many consumers don’t have bank accounts anymore, only a debit card. The financial strength of Transmerica has been awarded an A category by A.M. Best, Fitch,Moody’s and Standard & Poor’s. 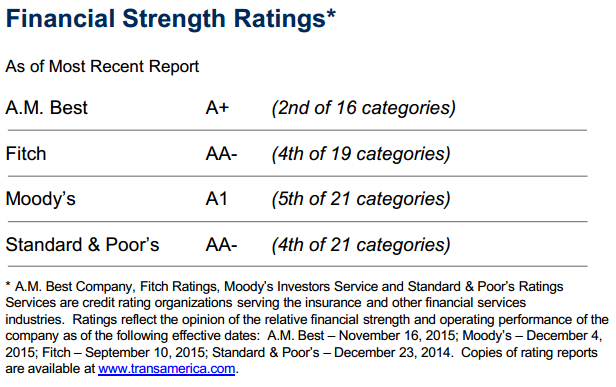 The chart below are the current ratings as of 7/7/2016, found in the Transamerica Financial Strength brochure. You can read more more about their financial strength at www.transamerica.com. Transamerica began in San Francisco in 1904 by Amadeo Gianni, an Italian immigrant determined to help the majority of people with financial services and not just the wealthy. He later started a bank named the Bank of Italy and soon after helped the people rebuild after the massive destruction from the earthquake and devastating fire of 1906. 24 years after he first began, the Bank of Italy merged with Bank of America and soon after took on Occidental Life Insurance company which still exists today. In 1956, the insurance side of the company split off, became Transamerica Corporation and in 1999 it became a part of one of the world’s leading financial entities Aegon where it remains today. Transamerica recently absorbed two very well know life insurance companies, Monumental Life and Stonebridge Life, and now offer only the Transamerica Premier Life Insurance company for final expense or burial insurance. Immediate Solution Preferred and Standard rates: Available for ages Lifetime payments- The payments and coverage will stay the same year after year and if you really live to age 121, the policy will mature and you’ll get the death benefit paid to you. The death benefit is 100% payable as soon as the policy is in force. Accelerated Death Benefit and Nursing Home Benefit available at no additional cost. Some won’t qualify for the nursing home benefit if you already need assistance with activities of daily living including eating, dressing, bathing, toileting and transferring. Children’s and Grandchildren’s Benefit rider is available at an additional cost of $2.00 per year for each $1,000 of coverage purchased. The parent or grandparent must be between the ages of 18 and 75, and the child mus be at least 15 days old and under the age of 18. Coverage is available for up to nine children, from $1,000 to $5,000. 10 Pay Solution Preferred and Standard Rates: Pay level premiums for a total of the first 10 years and the coverage is guaranteed to age 121, but you pay nothing else after the first 10 years. The premiums are higher than lifetime payments, but think of the person who is only forty or fifty years old…This person will likely have more spendable income during the first 10 years because they are still working. This is a fantastic option for those who want to minimize expenses by the time they retire. They will also likely save thousands over the years they don’t pay the premiums any longer. The death benefit is 100% as soon as the policy is in force. Children’s and Grandchildren’s Benefit rider is available at an additional cost of $2.00 per year for each $1,000 of coverage purchased. The parent or grandparent must be between the ages of 18 and 75, and the child must be at least 15 days old and under the age of 18. Coverage is available for up to nine children, from $1,000 to $5,000. Easy Solution: Lifetime payments: Pay level premiums for the life of the policy. Death benefits during the first two years the policy is in force are payable at a return of all premiums paid in plus 10% interest in some states and pays 30% of the death benefit in year one and 60% of the death benefit in year two in other states. Please refer to our independent agent for more specific information. Diagnosis of mild COPD or Emphysema will generally pass for the Immediate Solution product at a preferred rate. Moderate COPD without oxygen with the use of inhaler or a nebulizer may get the standard rate. Parkinson’s disease that has been mild to moderate diagnosed more than 2 years ago after the age of 30 would usually get an immediate death benefit at a standard rate. Mild mental retardation may qualify for the preferred rate Immediate Solution. Marijuana use accepted at preferred rates if the use is less than 3 times per week. Diabetes without insulin and diagnosed between the age of 30 to 44 can qualify for the standard rate. Bi-Polar disorder and Depression with no more than one medication, no hospitalizations and no loss of school or work may get the preferred rate. Patients with no more than 2 medications, no more than two episodes or two weeks loss of school or work, generally will be offered a standard rate for the immediate death benefit. Disability due to Bi-Polar or Depression is eligible for the Easy Solution graded product. Autism for ages 6 and and older that is mild will be considered at the preferred rate. Atrial Fibrillation that occurred 2-5 years ago should get standard and more than five years preferred rate. Alcoholism and drug abuse in recovery for five to eight years, with no drinking or drug abuse may get the standard immediate death benefit. Recovery for 2-5 years qualifies for the Easy Solution graded product. Diabetics with the use of any amount of insulin can qualify for the Immediate Solution standard rate. Even diabetics with neuropathy, retinopathy or other conditions as a result of diabetes may get an immediate death benefit. People who have had a stroke, TIA, heart attack, angioplasty, bypass, stent, pacemaker implant, diagnosed with multiple sclerosis, Parkinson’s or treatment or diagnosis for kidney disease more than 12 months and less than 24 months ago may also qualify for an immediate death benefit at the standard rate.